Garlic scapes are a delicious early summer vegetable, which are harvested from the garlic plant right before it blooms. The ‘garlic scape’ is essentially the unformed flour bud which is cut of to divert energy back into the garlic bulb, and not into producing a flower. If you grow your own garlic at home, this can lead you to having a lot of garlic scapes to use up. Maybe more then you can eat on your own. 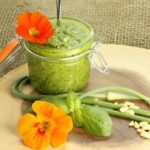 As basil pesto is one of the best ways to preserve your basil harvest for the fall and winter months, I figured why not apply the same method to garlic scapes and make garlic scape pesto? While the garlic cloves are not yet fully matured, I didn’t want these beautiful garlic scapes which are ready to be harvested, to go to waste. Garlic scapes, if left on the plant will turn into beautiful white flowers, the downside to this is that the garlic plants send all their energy into producing these flowers and not into growing the bulb, which is what we want for a nice large garlic harvest. 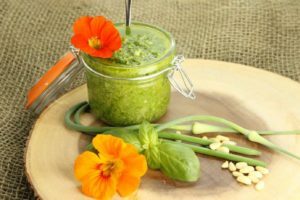 Once the scapes start to form it is best to remove them from the plant and use them in recipes such as this basil pesto. You can also grill the scapes and serve them as a vegetable side. They are simply delicious! 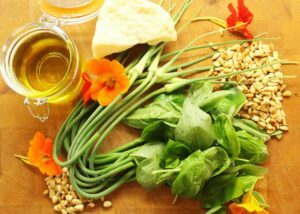 Once you have all your ingredients together, make sure to wash the garlic scapes and basil leaves if they came from your garden. If you are using store bought basil, it should have already been washed. Toast the pine nuts in a dry (no oil) pan over medium-high heat, making sure to shake the pan continuously so the nuts do not burn. You want them to be a nice golden brown, but not black. Toast for about 4 to 5 minutes and then cool the nuts. Combine the chopped garlic scape, fresh basil, and the rest of the ingredients in a food processor. Pulse the mixture until the mix starts looking like pesto! You can leave the mix chunky if you like or puree until smooth. Either way, the end product is sure to be yummy! You can freeze this pesto recipe to last all winter long, or store it in glass jars in the fridge for up to 4 months. It’s normal for your pesto to turn a darker shade of green once exposed to air, but if stored in jars and refrigerated right away the colour will stay nice and bright green for a long time. Also note that if you are using olive oil, the pesto will solidify in the fridge. This is normal and you can simply scoop out what you need when the time comes. It will loosen back up at room temperature. 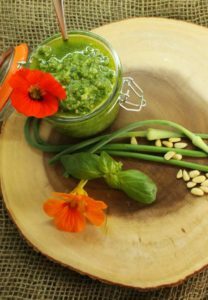 A deliciously simple to follow basil pesto recipe that uses fresh garlic scapes from the garden. Perfect for use in pasta and other dishes. 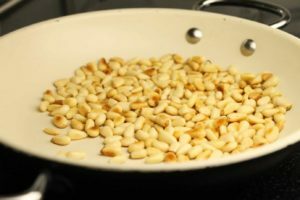 Toast the pine nuts in a dry pan until just golden brown, Make sure to toss the nuts in the pan as they toast to avoid burning. Cool the nuts and then combine all ingredients in a food processor or blender. Make sure you plant hardneck garlic Claire! Softneck garlic tends to not grow a flower stalk! Good Luck! Let me know how it goes. I love homemade pesto! 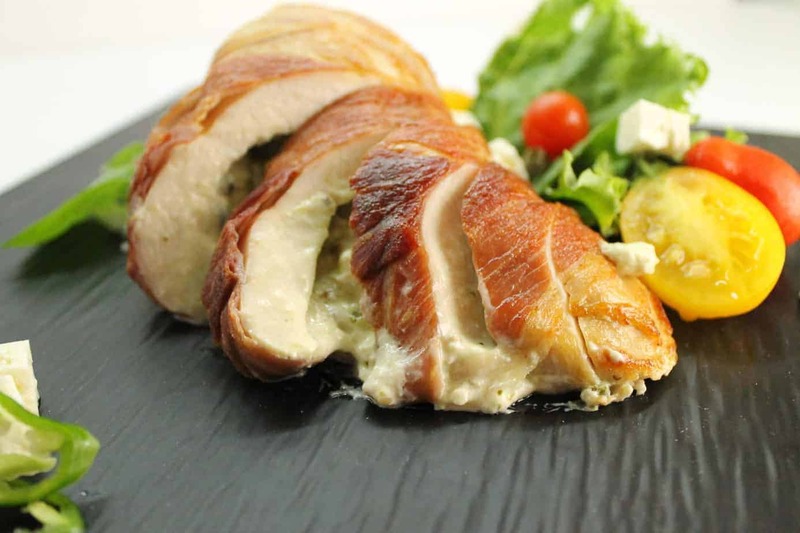 Your recipe looks and sounds so delicious and so easy to make! Perfect for hosting! Nothing more precious than a new addition to your family, every day is a new beautiful adventure congrats.. Your pesto is vibrant and colorful perfect for bruschetta which is what I cant wait to use it on! O you’re right Claudia! This pesto would be fantastic on bruschetta! I even use it in pasta’s and in chicken stuffings! HUGE congratulations to you and your wife! I can certainly understand how busy you must be right now! This is a lovely, wonderful sauce, and I loooove the fact that you used garlic scapes in it. I love the garlic element in pesto as a rule, but I’m really excited by anything that amps it up with garlic scapes. Great job! Thanks Sean! I have recently been cooking up a storm with garlic scapes! Grilled scapes, Mussels and garlic scapes, dried garlic scape powder! I have garlic coming out of my ears! Congratulations to you and your wife on your little bundle of joy! Enjoy every moment…they grow so fast! I love making pesto with fresh basil from the garden!! Great recipe???? What great timing! Today I had been thinking about a new pesto recipe to try out. This looks great & I love the inclusion of the nasturtium. It would give it a peppery taste. 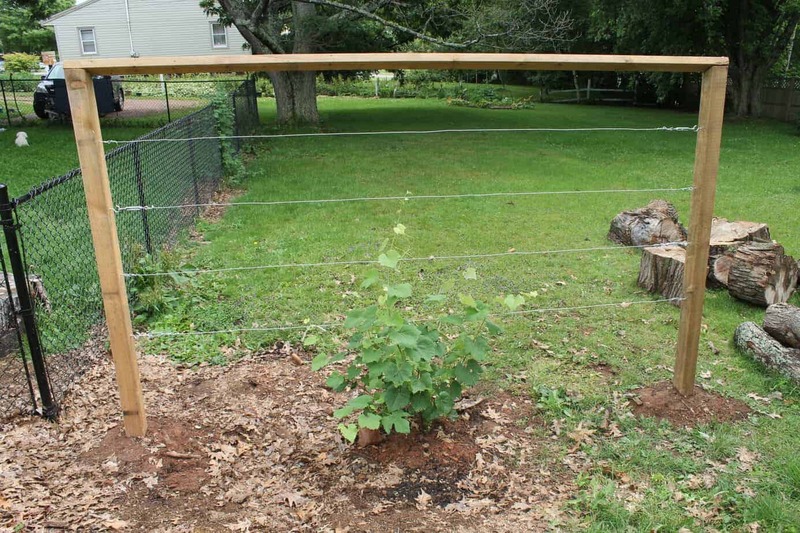 I find nasturtiums, are not that widely used outside of as a garnish. They really add quite a kick to the pesto though! Thanks Mairead! I try and use as many fresh ingredients from my garden as possible!